Classes continued working with their Complex Machines trying to lift the 1000g mass with the least amount of effort. 6-419 was on a trip today. Many students were working with the pulleys, inclined planes and levers together to form a Complex Machine. Some classes were on a trip while Mr. Olamit was still out at the Graduation. Our classes finished their work on Pulleys. The paperwork for the experiment needs to be finished for HOMEWORK. Textbooks were again collected today. Mr. Olamit was not in school today; he will be absent again tomorrow. We are now going to see what happens if we start putting things together. What if we add a pulley and lever to the inclined plane and try to lift the 1000g (10 N) mass to a height of 20cm? Mr. Grambo was on a trip with the eighth grade (Senior Trip) to Holiday Hill in Connecticut. He left a Quiz on Force with the substitute teacher. Mr. Olamit was working with the Pulley Experiment (6-341 and 6-419). Textbook collection tomorrow. Today is a 1/2 day for students. Students were handing in textbooks and working on their pulley experiment. All our classes met with us today and everyone received their test back. We started working with the pulleys in every class. So far the dead lift (part 1) still gives us 1000g. The single fixed pulley in part 2 only changes the direction of the force. The spring scale still registers 1000g (10N) in this part of the experiment. What will parts 3 and 4, using the free and fixed pulley, bring? 6-235 and 6-341 started their experimentation on using a pulley to help lift a 1000g (10N) mass to a height of 20 cm. There is no school today for students (we still had to go into work). It is Brooklyn-Queens day/Anniversary Day/Chancellors Day. We have meetings on this day. I had to go to a meeting at Tweed Courthouse with the Deputy Chancellor. We are going to have a discussion on Education Reform. 6-237 never finished the lever experiment, so we did it as a class helper/demonstration today. All other classes took their quiz on the lever. All our classes went on a trip today. Mr. Grambo went on the trip with the second floor classes to the wax museum. It was terrific; the wax figures looked soooooo real. There was an exhibit near the end of the museum that explained how the figures were made. This exhibit included the news caster Al Rocher. Figures of our presidents were represented as well as figures from art, sports, music and science (they even included Albert Einstein). There were terrific opportunities for taking photographs. We took a really great group photo with Louis Armstrong. Today was a clerical 1/2 day. Everyone went home at 12:20. 6-341 and 6-419 took their Quiz on Levers today. 6-419 did not finish it and will finish on Wednesday. 6-235 wrote their rule of thumb on levers and learned about Mechanical Advantage. Wednesday, 6-235 will get their quiz. 6-237 and 6-239 will get their quiz this week also. The second floor sixth grade will be on a trip tomorrow (going to Madame TussaudsWax Museum); so will 6-419(going to the Cloisters). There is no school on Thursday of this week. Almost everyone was on a trip today. 6-341 helped bring the equipment for the dance down to the Cafeteria. Mr. Olamit helped with the Dance Set Up during period 8. We are still camping. Today we left a reading on Simple Machines PART 2. On Wednesday, Mr. Olamit met with 6-419 and 6-341 in their classrooms. Both classes handed the pg. 72 Lever handout that they previously received for homework. Then in groups, 6-419 set up their Bobs for the Pulley experiments that we will do next. Since the desks in room 6-341 were in rows, we set up Bob for the Pulley together as a class. Mr. O drew a sample of each page on the board, going page by page; 6-341's notebooks should be perfect! Both classes had time to work on their pg. 76 Simple Machines Pt. 2 homework handout in class. We woke at 7:00 AM. We were supposed to fly our rockets today (everyone on the trip has built an Estes rocket). The wind changed direction and planes for Kennedy Airport were close to us. The control Tower at Kennedy told us we could not fly the Rockets today. We will find a place in September or October. We talked today about recycling and went to the Compost bin, where food items were being turned into soil. We left at 12 noon and arrived at school by 2:00 pm. We went on a Camping Trip to Gateway National Recreation Area. A long sheet reading on the Lever was left for everyone. Mr. Olamit worked with 6-341 and 6-419 on setting up their notebooks for the next experiment on Pulleys. On Tuesday, Mr. Olamit saw 6-419. They did their second day of working on the Lever experiment. At the end of class, the Lever pg. 72 handout was given out for homework. Our bus arrived at 9:30. We packed the bus and we were off to Gateway. We arrived at 10:30. Unpacked and set up the campsite (with Mr. Yaskulski- The 8th Grade Science Teacher in room 248). It was off to the beach. Some students took water samples for testing (pH, dissolved oxygen) others drew pictures and looked for biotic and abiotic items in the soil at the beach. After the beach we walked to hanger B. Here are housed several World War II planes. This area is called H.A.R.P. (Historic Airplane Restoration Project). We went on a guided tour. We went back to camp where we ate dinner, set up a campfire, ate Smores and played the game of Man Hunt on the runway (remember that this is an old airport). Today is Memorial Day, there is no school today. Everyone has finished the Experimenting part of the Lever Experiment. IT IS HOMEWORK to finish the written part. We will start on Pulleys this next week. Remember that the Dance is next Friday. All our classes continued experimenting with the Lever. As the distance between the load or Resistance (the object you are lifting) decreases, the length of the effort arm (effort is what you do to lift the load) increases. The amount of effort showing up the the spring scale keeps decreasing. This has something to do with Mechanical Advantage. Mr. Grambo was at a meeting at the Department of Education. He left a reading assignment on Archimedes. Today, 6-419 finished their class "Rule of Thumb" for the Inclined Plane. Then they set up their Bobs for the Lever experiments (pp. 63-69). They received the Archimedes worksheet for homework, though some had time to finish it in class. 6-419 was on a trip today. We continued with our work on the lever. We have to experiment, moving the 1000 g mass closer and closer to the fulcrum. Today we began work on the Lever. We looked at a giant See Saw and had a big person stand on one side, while I lifted and lowered them using only one leg on the other side of the lever arm. We looked at the equipment at table five and read the instructions on page 45 of the Building Big Things TEXTBOOK. We are ready to work (notes go into "Bob" starting on page 63. 6-419 saw the Spring Concert in the Auditorium today. We received Progress Reports today. We came back from the Hall of Science at about 10:00 AM. I was really sick, so Ms. David sent me home. We worked at producing Graphs from our collected data. We made bar graphs (Horizontal and vertical). We made line graphs and circle graphs. All graphs were labeled and made in color. Tonight is our Fifth Graders overnight trip to the New York Hall of Science. We also went over the math involved in figuring out the Pythagorean theorem. Tomorrow is the Fifth Graders overnight trip to the New York Hall of Science. 6-321 does not have science on Tuesday and all the second floor classes are on a trip (to the Zoo). 6-419 continued working with the inclined Plane. We are ready to come up with a Rule of Thumb. Today we got back all of the work from last week. We glued this work into our "Bob" notebooks and got our books ready for The next experiment which is about the see saw, teeter totter, or in scientific term, the . There were many questions on Square Root and what it means. I spoke to our resident Math Expert, Ms. Turini. She said she will come in to explain it. The student seated at station 5 of the group is collecting your "Sally" notebook. We are still selling flowers and plants to the students of our school. Class were held in your Homerooms. Room 246 was taken over by the 4-H Club Mothers Day Plant Sale. Work was left on Pathagarus and his ideas about triangles and math. After lunch, we were ready to leave. The bus picked us up at 2 PM. We arrived at school at 4:15. The last student was picked up at 6:30. We woke up around 7am. The children showered and cleaned up their room. We would have a very long hike this mourning, so the children needed to get ready. Breakfast is at 8:00 am (waffles, cereal, and milk)We hiked on the tumbling waters trail for about 2 hours. We followed the orange and white trail markers up then down a mountain along single file trails. We reached the water fall at about 10 am. The children crossed a stream to search for wildlife. We found frogs and salamanders. We left the fall at 11 and returned to PEEC center at 12 noon just in time for lunch. (chicken nuggets, fries and salad) After lunch our group worked on stream ecology finding nymph form for many flies and other insects a invertebrates. Many children, however, stepped in poison ivy and had to wash up with ice water and detergent. The children got a bit wild about what they touched. By about 9:00 pm at least four children were scratching. We sprayed an itch relief medicine on the four children. At night (prior to our hike) we played a game called Town Meeting. A sinerio was set up where a n abandoned camp in an area is being looked at by several developers. In groups of four and five children took on the role of these developers anyway to build schools, animal sanctuaries, and even malls. This game, full of ideas and arguments began with children for brainstorming ideas and then presenting their ideas to a mock board of Directors. This game went from 8-10 PM and could have gone on a few more hours. After this game came the night hike. We did life savers/ color of crayons. The children arrived at school at 7:30 AM; we labeled all of their cell phones and medicine and took all these items away from them. Lunches were also taken away and put into large plastic bins so it would be easy to retrieve them at lunch time.At 8 AM, we received a phone call from the bus company that the would be late (An oil problem). They arrived by 9 AM, however, the bus was a 47 seat bus and everyone had to squish. The bus took a convoluted route to PEEC on Route 209 in Pennsylvania, which brought us there by 1:00 pm instead of the intended 11:30 AM. Then the children unpacked and brought their clothing and bags to their cabins. It was time for the meet and greet and other few activities. There are several activities that the children will do. The activities are staggered by group over the three days that we are there. Many children were taking photos of their activities. Dinner was at 6 PM. We had turkey with stuffing and salad bar. The food tasted good. After dinner we had some free time for games, writing in log books and making calls home. At 8 PM we set up for the Dutch Auction game, In room 2 of the lodge. We played for two hours and then went off for bed. Breakfast will be at 8 AM. We are continuing to work on the Inclined Plane experiment. There are four parts to the work. First we lift the block (dead lift) and measure the force required to lift it. We then pull the dynamics cart up the ramp, which is set at three different heights of degrees of slanted ness. All our classes met today in Mr. Blum's room (315). It was Tug Of War day. We have been talking about Balanced and Unbalanced Forces. Today we saw these forces in action. There were always four people on each side. The room was covered with crash mats in case anyone fell. Sometimes the forces were so unbalanced that the game was over reallllyyyyy fast. Other games had students pulling with such balanced forces that the rope stayed in the middle for a really long time. Everyone had so much fun. Many students have been gathering EVIDENCE of their experimentation. They have been taking photographs and getting witness signatures in their journals on page 55 (Bob). Our Mass is 1000g, however, when using the Inclined Plane, the Spring Scale only measures between 500 and 600 grams. Can we predict the amount of force required compared to the angle of the incline? Tomorrow we will go to Mr. Blum's room (315) for a workshop on Balance and Unbalanced forces in a game of Tug of War. 6-235 has finished their work on the Inclined Plane. 6-419 just finished their POE charts and will begin work on the inclined plane. On Monday - Wednesday of next week I will be taking students to the Pocono Environmental Education Center (PEEC). On Thursday and Friday (May 10-11) we will be having a Mother's Day Plant Sale in room 246. Please make sure you finish up your Poems and maps for your My Piece of the Neighborhood Project. Many classes are beginning to finish up the Inclined Plane experiment. Students are noticing that the Spring Scale registers about 400 g when pulling the Dynamics Cart up the medium slope ramp to a height of 20cm. The blocks mass is 1000g. Where did the other 600g go? One more class (6-419) has to have their "Sally" books collected. We will be working in Mr. Blum's room on Thursday (Tug of War - Balanced and Unbalanced forces). We will check the My Piece Of The Neighborhood project this week looking for the POEMS and Maps to be finished. We continue to work on our experiments with the Inclined Plane. We are writing about this experimentation on pages 52-55 of "Bob". At this point, everyone is now working on this experiment. Some classes began an experiment to see if an Inclined Plane (a ramp) could help achieve the goal of raising a 1000g mass to a height of 20 cm using a strand of sewing thread. Other classes were finishing up the seven force demonstrations. We worked on the seven demonstrations today, and finished them. We hooked the force probes up to the computer and used the probes to show and measure forces that were pushing as well as pulling. We were observing a mass being acted upon by both balanced and unbalanced forces. We also took a look at lifting a block and the forces associated with it. Forces that are small. medium and large show no strength. Two people of the same size could push differently for medium. This is very subjective. We need to measure the forces with something. On page 42-45 of "Bob" we will work on viewing seven (7) demonstrations. We will Predict what will happen. Observe the demonstration and Explain the outcome. We call this a POE. We also used computer Force Probes to help measure in this experiment. We began the period by asking everyone to write what they felt the word FORCE meant onto page of "Bob. After asking someone in the class to sit in a bucket, we began to apply forces to the bucket. The forces were small, medium and large. W observed what happened, drew pictures and then went back to our desk to come up with a team definition for the word FORCE.. By the end of the period, we were sitting in a giant circle in the hallway sharing our team definitions and coming up with a class definition for FORCE. We call this process a Think, Pair, Share. We continued working on our new science unit. All work is being written in our "Bob" journals. Classes are going out on our Construction Site Walk. 6-419 handed in their "Sally" journals today. Our School dance is tonight at 5:30 PM. April 18, 2007 (Thursday) We are working on simple and complex machines unit called Building Big Things. This unit has a goal; a driving question. How can we lift a 1000g mass ( 1 KG or 1 N) to a height of 20 cm using a single strand of sewing thread? We tried a Dead Lift and we observed how that worked. We cannot lift a automobile off the floor, however, a tow truck can. What does a tow truck have going for it that we do not? Tow trucks and construction equipment can lift things we cannot. We then saw a video (Hard Hat Harry) about construction equipment and we wrote our observations onto pages 32 and 33 of BOB. We have a Building Big Things website at: www.armstrong227q.com/buildingbigthings Our journey led us outside to a walk through our schools construction site. We discovered new materials and equipment that we have never come in contact with like double head nails, posts and lintels. This information along with drawings were placed onto pages 34 and 35 of Bob. After gluing a Grading Rubric into "Bob" on pages 188-189 we viewed a video on Construction Equipment. The Movie was about Big Construction Machines with Hard Hat Harry (We have a copy in the school Library for circulation). We talked about the trucks including a Crane, Back Hoe, Front Loader and Dump Truck. We wrote about the machines on pages 31-35 of "Bob". We looked over our new equipment and received our task or Project; to lift a 1 kg mass to a height of 20 cm with a single strand of sewing thread. Each class got to fool around with the equipment for a few minutes before the period ended. I will start to collect the "Sally" notebooks tomorrow. On Monday we got up at 7:00 AM and began to pack up all our clothes. We are going to leave Space Camp early because they already have 6 inches of snow on the ground ( It snowed last night) and there is a storm in northern New York that we do now want to get hit by (the weather service says 50 mile per hour winds). In School I left a Word Search Puzzle on Machines with Spelling and Vocabulary. We woke up at 7:00 Am and had Breakfast (cereal, toast and pancakes). We were off to the Briefing Room for our Shuttle Mission. We found out what we were going to do and how to read and perform our duties. Everyone put on costumes and we started our one hour mission aboard the Shuttle Simulator Endeavour. Serious, serious, serious. Everyone was soooooo serious. Mission Control told us what to do as we lifted off. Mission Specialists suited up into Space Suits and went into the Shuttle bay where they climbed aboard a Canada Arm, which lifted them up into the air to repair a satellite. Everyone had such a good time. Graduation is at 3:30 PM, but we still have to see which bridge that we were working on is the strongest. Tonight we are going into Montreal to the Hard Rock Café for dinner. We woke up at 7:00 AM and started our days activities. Some groups already did the Multi Access Trainer (where you spin in three directions at the same time). while other were in the MMU. The MMU allows an astronaut to move through space with a maneuvering pack on their back. It is now Lunchtime. I will send more information later. Lunch was something called Shepherds Pie. It was ground beef covered with corn and then mashed potatoes. Well at least it tasted OK. After lunch our group did the one sixth gravity chair. The chair was suspended from the ceiling by a major group of springs which counterbalanced most of your weight. When you jumped, you went up about 12 feet. It was then off into the air space museum. There was a wonderful 3-D movie where the room turned and the seats spun and tipped. The movie was about space. As we walked through the museum, we discovered things about space and our planets. We got to see a real spacesuit. They even had moon rocks. It was time to have our Egg Drop contest. What a mess. Most of the structures did not keep the eggs from breaking. Two groups really did a good job on the project. One used a parachute system. The other kept the egg suspended inside of Styrofoam cups using masking tape. At 5:00 PM we ate dinner. Pizza, Real food. Our group is going to fly a Shuttle Mission tomorrow, so we had to pick which person was going to be Shuttle Commander, Mission Specialist and so on. We had to pick people for 12 positions inside the Shuttle and Mission Control. We left school on Friday at 9:00 Am. We stopped for lunch near Albany and arrived at the Canadian Border at 4:00 PM. We sat there for one and a half hours behind a Greyhound Bus that the Border Guards were going through. We arrived at Space Camp at 7:00 PM. We had an orientation and went through a few simple space activities in the Log Book they handed out. One of the activities had students building a structure that would keep an egg from breaking if it were dropped from a height of 50 feet. We then had a snack (apple pie and juice). It was off to bed at 10:30 PM. In school I left a Reading Assignment on Machines. We began our unit by looking over our new equipment and playing with the new "STUFF" for a while. Our Project or Task for this unit is to eventually lift a 1 Kg mass to a height of 20 cm with a single strand of sewing thread. We started our unit on Simple and Complex machines called Building Big Things. We started by gluing sheets about construction and construction equipment into our "Bob" notebooks. Yes, we are back in our Bob book. 6-419 was on a trip, so 419 and 239 will get this work on Thursday. I will be going to Space Camp on Friday with Mr. Y. We will come back to school on Monday evening. Sally notebooks will be collected next week. We were off from school for Spring Recess (11 days). We had to finish the Insect ID and What We Learned Foldable over this week. Today we finished up our Bug Camp unit. We looked over every page and made sure we answered all questions. We also finished up our Grasshopper Dissection. We were using the microscope today to view small sections of the insects body. Most students finished the microscope sheet on page 100 of Sally. If we cover our microscope slide with tape, we can keep the slide and attach it to our journal. Classes were dissecting today. We found rice size pieces inside the females. These were the ovaries. The females were larger and the brown stripes on the bodies were thicker on the female. Some classes got to cut into the grasshopper today. Getting through the exoskeleton is rather difficult. You have to start at the end of the grasshopper and cut towards the head. After doing this on both side, you connect the two horizontal cuts and peel off the exoskeleton. Inside are the various systems including the Digestive, Respiratory, Nervous and Circulatory. Everyone was drawing views of the inside of the grasshopper. Some were looking at parts of the grasshopper under a microscope and making drawings onto page 100 of Sally. After looking at and grading parts of the "Sally" book we began to dissect a Grasshopper. There were some sounds of disgust for a few seconds and then everyone got into it. Today we looked at the external parts of the specimen. We recorded our observations in our dissection guide on page 117. We we get to section C of the guide, we will open up the grasshopper and look at its internal organs. It smells a bit funny from the chemicals they put on the grasshopper to keep it from rotting. The Third Marking Period ends today. Mr. Grambo went to Chelsea Piers with the eighth graders. During period 8, he was at a table in the hall grading papers that students wanted entered for this marking period. Mr. Olamit worked with 6-341 and went from table to table grading last minute papers indicated missing on the Progress Report. Next week we will be dissecting Grasshoppers. You need to get the permission slip on page 116 (Sally) signed. Most classes were working on pages 120-123 of "Sally". Mr. Olamit and I went from table to table grading last minute papers indicated missing on the Progress Report. Were Checked For SIGNATURES. Today we watched A Bug's Life in the Auditorium periods 6-8. It was a bit noisy, buy most students stayed focused. We worked in our Sally book on page 129. Mr. Olamit and I went from table to table grading last minute papers indicated missing on the Progress Report. We worked today on pages 120-124 of Sally. These pages were about Food Webs, Food Chains and Energy Pyramids. We will finish this on Friday. Progress Reports Were Checked For SIGNATURES. We went outside to Veteran's Park to add another visit to our Site Study of this area. We worked in the booklet on page 73 of Sally. It snowed the day before, so we were able to see animal tracks (dogs, humans and squirrels). The shadows from the fence around the perimeter of the park caused the snow to melt in an unusual way. We also noticed that the snow around trees and plants was melting faster than any where else. We added pictures to our site journal entry (Page F and G on 73 of Sally). Go to: Pictures of Veteran's Plaza - March 19, 2007. We received a Progress Report today. I was supposed to go to Chelsea Piers today with the eighth grade, but it was cancelled due to the snow. The trip is to be rescheduled for next Friday. I left an assignment on Symmetry in the Insect world, where you had to draw the second half of an insect. Mr. Y and I were setting up the Science Fair in the Library all day. The sixth grade projects are really good. You will get a chance to see the projects next week. In class I left an assignment on Lightning Bugs. These insects are really beetles and glow for their entire life. I stayed in school with Mr. Y and Ms. Kahn until after Parents viewed the fair. The parents were really impressed with your work. Today we continued with Insect Architecture. Our drawings on page 124 are to be in color. On page 125 ("Sally") we have to try and figure out how the insects made these artifacts and which body parts they made them with. Tomorrow (and Wednesday) is the State Math Test. We are setting up the Science Fair on Thursday. Today some of our classes started on Insect Architecture. There are five insect artifacts in boxes and a set of readings about the insects that made them. Your job is to figure our which insects made which pieces of architecture. What were they made for. Are they insect HOMES? Are they food, nurseries for the babies? Why were they made? We are working in our "Sally" book on pages 124 and 125. We are to make drawings of three of the artifacts. We will finish on Monday. We have finished our presentations. Today 6-419 worked on the Bug Camp experiment about Insect Architecture. What types of homes or structures do insects build? We do not want Termites in our homes, but what about in the Forest? We had visitors in our class when 6-419 was there. We are soooooo close to finishing up our Science Fair Presentations. Only one more day to go. Team 6 made their presentations today. Tomorrow will be our final day (except for 6-237. Their final presentation date is Monday of next week) for Science Fair Presentations. You will need your Sally book for Thursday. We will be doing Insect Architecture or Insect Homes. Today, Team 2 presented their projects. We still have to see projects from teams 6 and 4. Team number 1 presented their Science Fair Projects today. Today we have seen half of our classes projects. Today we heard presentations about projects from team 3 in some classes and team 1 in others. Tomorrow We are going to bring some of the Auditorium Risers up to our room. This might make it easier to sit and hear/grade the projects. By tomorrow we should have heard from half the class. Today, 6-341 presented table fives projects while our other classes presented projects from team 3. This morning was the practice Math Test, so we did not see 6-237 for science. Team 3 from 6-237 and 6-239 will present their projects on Thursday. Everyone has to hand in the following assignments: The Science Fair Word Search Puzzle and the Reading on Mating and Reproduction. Team number five (5) started to present their projects today. We did not see 6-341 today, so they will present their projects on Wednesday. Science Fair Projects and "Jake" books have to be handed in for grading. Today all classes received their Science Fair Presentation Schedule. I did a presentation of a project on Chromotography. The class used a Gallery Walk Sheet and the Grading Rubric (pg 8 of Jake) and graded my presentation. We also had two worksheets to do for homework. One was a reading assignment on Mating and Reproduction. The other was a Science Fair Word Search. We had off from school. I sent four e-mails to everyone this week. We finished our work on metamorphosis today. With complete metamorphosis we have an animal going into a cocoon stage and emerging as an adult animals that looks completely different from the baby. With incomplete metamorphosis, we have infant insects looking like small adults. Today is Open School Night. I will be in room 246 to meet with your parents from 6:00 PM to 8:30 PM. In class we worked on the Life Cycle or the Circle of Life for insects. We found out about Metamorphosis and Incomplete Metamorphosis. Many students were absent today due to the snow and ice. Our classes finished up the work on the Haiku poems. Tomorrow is Open School Evening from 6:00 PM to 8:30 PM. We put up the poems in the hallway above the bulletin board. Yesterday I got to talk with 31 parents. Today was a half day due to Parent Teacher Afternoon. We worked on writing Haiku Poems about a butterfly. We wrote a copy of the poem into our notebook on page 150. We also glued down the "RULES" of a Haiku Poem: Three (3) Lines. First Line - five syllables, Second Line - 7 Syllables, third line - five syllables. After school, Mr. Levin and I stayed to set up a District 30 meeting. They talked about the restructuring of the school system and how Tweed (Central Board) was trying to make things better in the schools and was trying to figure out ways to help students learn better. We finished our drawings and went on to adding five sheets to our "Sally" book. We also had a Candy Sale Assembly during period 1. Today we worked on drawing the male and female Monarch Butterfly and Cecropia Moth. If you are not finished with your drawings, go to Google Images and type in Monarch Butterfly Male and Female (you can do this with the Moth also.. Pictures will come up that you can examine and draw from. The Dance is tonight. Classes began to work on page 110 of "Sally" on finding the differences between the Male and Female of a species. In this project you had to examine butterflies and moths, note their differences and draw pictures of these animals. It will take another class period to finish up this project. As of now, all "Sally" notebooks have been collected and graded. We have also grade the A Man On The Moon article (page 55 of "Sally"). Today, Mr. Olamit, Mr. Blum and I went with 6-317 and 60341 to Alley Pond Environmental Center in Douglaston, Queens. It is on Northern Blvd near 228th Street. We hiked on the trails and got to see and touch several animals including a snake, rabbit and ferret. The classes were given an assignment where they had to read two articles from encyclopedias on cells. You had to compare the articles and find similarities and differences. This assignment was collected. We find that there are sooooo many different insects on the Earth. When classifying them, we really need to notice all the differences between the insects. Today, we were measuring insects on pages 98 and 99. We had to convert the CM ruler measurements (in metric) to MM. We also had to create a bar graph from these measurements and then answer some questions. The notebooks of 6-341 and 6-237 were collected today. 6-341's books have already been graded and returned. They set up the metal detectors today and made everyone move through the detectors as they came into the school. Students were asked to remove belts, shoes and anything else that might set off the detector. Many cell phones and i-pod (music type equipment pieces) were confiscated by the officers. Parents will have to go to school to pick up these items (this is the only way they will be returned to you). On Thursday and Friday, we went over the Classification of Living Things. On page 94 and 95 of "Sally" are words that we need to understand. Look over your GLENCO (orange cover) New York Science text book on page 227 it will again explain Classification of living things. Everything in the world (Living and Non Living) can be classified or put into groups because of similar traits. We will be collecting your "Sally" books this week. Last week everyone was given a yellow sheet that again stated everything that would be checked in the "Sally" Nature Journal. We are looking at the Moon Project and the My Piece Of The Neighborhood Project. Please make sure your book is ready and up to date. On Wednesday, I will be taking 6-341 on a trip to Alley Pond Environmental Center. All classes will be given a reading assignment on Cells. There are two articles that are about the same thing, but were taken from different places. We need you to compare and contrast the two readings. Today we went over Classification Skills (page 94 in "Sally"). Classification alloys us to group objects and gives us reasons for our groupings. Imagine a Library without a reason for the placement of books around the library. The Dewey Decimal classification system helps us group books so that you can find them. Everything on the Earth is classified. We break everything into two groups (Living and non living) first There are six things, reasons, rules, laws that something must have in order to be alive. Once we get an alive pile, we look at the cells to see if it is a plant or animal. The plant cells have cell walls and chloroplasts, animal cells do not. This level is called the Kingdom (plant or animal.) We then break down into more groups by skeletal (or non skeletal) structure, backbone or non backbone. The final step is male or female of a SPECIES. "Sally" books will be collected beginning February 5, 2007. The Moon Project and My Piece of the Neighborhood will be graded. Almost everyone in 6-341 has brought in their permission slip for next weeks trip to Alley Pond. Mr. Grambo was at a science meeting with the Department of Education and was not in school. He had us working on a Science Fair Reading assignment where we actually wrote the answers to the questions in our "Jake" book. Today Mr. Grambo was not in school. He was called in to serve Jury Duty. He left work with the substitute teacher. The work was to be collected after we finished with it. Friday is the end of the Second Marking Period. Mr. Grambo sent us e-mails each day telling of his Jury Duty adventure. Today we graded our "Sally" and "Jake" notebooks and the finished with the Power Point on Cell Structure. Friday is the end of the Second Marking Period. A few weeks ago (the day we came back from Winter Recess) we received a Progress Report telling if we had any missing work. Everything is due in this week. Today we say a Power Point presentation on the parts of the cell. The pictures were taken fro our textbook beginning on page 235. We found out about the names of the parts of a plant and animal cell and how those parts work together to make the cell a living thing. Many classes were out of the building today. The second floor classes went bowling and the fourth floor went to the Museum. 6-341 went over some parts of the cell today. On Monday we are checking Jake and Sally. We are looking for 12 site entries (My Piece of the Neighborhood Project - Pg 14-17), Moon entries (Drawings for Jan 1-22) and in Jake we are looking on page 7 and 2 to see if you picked your project and if Mom/Dad signed off on it yet. Please make sure you have all of this done by Monday. You should have started the experimenting part of the project by now. Stay up to date and on task. The sixth grade classes were finishing the third part of the ELA this morning. We talked about cells today and worked on the sheet where you had to pick three cell parts that you felt were the most important. Wow, everything seems so important, how do you pick just three? Today we talked about Cells and received a sheet with definitions about cells and information about the parts of these living things. Your job is to tell about the parts that are different from each other and the parts they have in common. You also must tell which three (3) parts of the cell you think are most important and why. We will go over the parts of the cell on Thursday and Friday. Note: Friday is the Hunter test and many students will be absent (they are taking the test). Today we began to go over animal and plant cells . We talked about the cell membrane and how nutrients pass through this semi-permeable membrane. On Thursday we will look to see if pages 7 and 2 are done in "Jake". We will also look in "Sally" for 12 journal entries for My Piece of the Neighborhood and we will look to see if the Moon Project is up to date. We took the first part of the ELA today also. Today is Dr. Martin Luther King's Birthday. There is no school today. Today we finished talking about the Science Fair Projects and went over the Contract (page 2) and Idea List (page 7). By now we are ready to begin working on our projects. 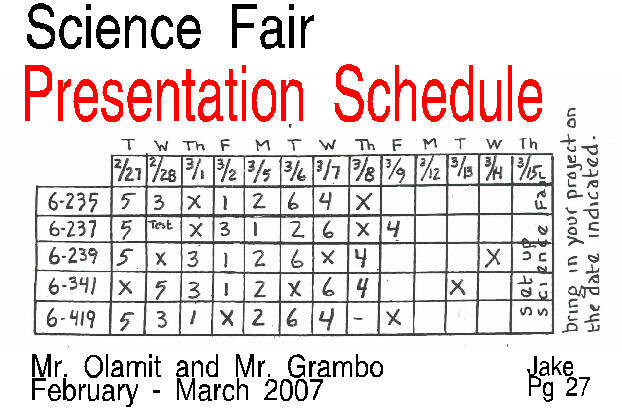 Do not forget to check the Science Fair Web Site at: www.armstrong227q.com/sciencefair you can find some great ideas for projects there. To make sure that everyone reallllyyyy understands what is expected of them for the science fair project, we went page by page through "Jake" and explained what to do on each page. Oh, by the way, daily summaries for this week can be put on page 41 of "Jake". We even added the Janice VanCleave sheet and the daily summary page to the Table of Contents on page three. Today we looked at a few science fair projects from past years that won in the fair. We also talked about making sure Mom and Dad do not take over and do your project for you. There are a few project ideas you can not use. You can not make a dream house, do a project on the Solar System anything on Alarms or make a Volcano. Today we watched a Science Fair video by Janice VanCleave. They were making a project on crystals (How can black construction paper affect the growing of salt crystals?). As we watched the video, we worked on questions to be put on page 40 of "Jake". We went over the parts of the Scientific Method and how the project is to be put together. Mr. Olamit paused the video, in places, to help us answer the questions on our worksheet. This week we should get an idea for our project and should gather up supplies like markers, paper, rulers ink for the printer and other things we will need to put our display together. Today we glued our Science Fair Journal (Jake) together. A table was set up in the hallway. We went out one desk at a time to get our papers. There was a blue card in a box at our desks to help us understand where things go in our new book. There is also a web site to help us at: www.armstrong227q.com/sciencefair. While we glued our books together, Mr. Grambo and Mr. Olamit were re-marking "Sally" notebooks and papers that needed to be graded. We finished going over things that make something alive. Things that are alive must breath, reproduce, take in nutrients, remove waste, and must eventually die. Today, most of our classes worked on the six things, criteria, rules for being alive. 6-341 was taking a practice ELA so they did not have science today. It is day four of our Moon Project. Yesterday was the Full Moon. Next week we will again collect Comics for a Comic Book Trade during the week of January 14. We will collect comics all next week during Homeroom. 6-341 received their progress reports today. A few classes finished the grouping assignment on page 93 of Sally. Other classes began to learn classification skills. We began to make a list, a set of rules that an item needs in order for it to be alive. If the object does not do all six things on the list then it is not alive. So far for our trip to PEEC on May 7, 8 and 9 we have 28 students going from our classes. The bus can hold 50 students, so there is still room. Today is the Full Moon. Today in class, we received our Progress Reports and talked about making up missing work by Friday of this week (January 5, 2007). We also got back our Leaf Identification Cards. Some students need to fix things on their card for the classroom leaf collection, some never turned in the card and have to do one by Friday. We also found out that we need to have our new Science Fair Notebook for next Monday (January 8, 2007). After all this, we went over how to use the microscopes that are on the side of the classroom, We found out about the lens, the stage and slides. We found out where to put the slide on the microscope and how to make a larger picture come in clear with the adjusting knobs. 6-341 did not have science today. I went through the Leaf Identification Cards everyone was supposed to make for our class leaf collection. This was part of the Tree and Leaf project due December 1, 2006. Most students did not hand this in. You will all receive a sheet stating your grade on this project and how you can make the grade up (or better) You must do this project. Progress reports (showing all work handed in or still missing) will be given out next Tuesday and Wednesday. The Second Marking Period ends in a few weeks. The Moon Project begins on January 1, 2007. This is in a few days. Look over what you have to do for this project. Start to look through Google, Yahoo, Dogpile, (and other search engines) to fide views of the Phases of the Moon. 6-239 and 6-341 worked on the Phases of the Moon reading assignment. Everyone also worked on the reading from this past months ELA test. This reading was on the tides and how the tides are caused by the Moon. We are now ready to begin our Moon Project on January 1, 2007. Today was the Community Concert, so we did not see Mr. Grambo. Mr. Olamit taught 6-419. This week we got a reading assignment on the Phases Of The Moon. 6-341 and 6-239 did not get it yet. They will do the assignment in class on Friday. While looking through the Lab (room 148) this morning I found more Riker Mounts (the black boxes that hold the butterflies) filled with Butterflies and Moths. These riker mounts are on the round table. There were many other ideas for ways to group. We then worked on the sheet appearing on page 93 of "Sally". Mr. Olamit show us some new insect collections we could use that were on the round table near the library area. We were told we would get a progress report as soon as we got back from vacation. Today Mr. Grambo was on a trip to the backstage tour of Radio City Music Hall. We had a reading assignment about the phases of the moon. Our Moon Project begins on January 1, 2007. This reading assignment will help us understand why the moon has phases. The second floor classes and 6-341 were drawing pictures in "Sally" of four of their insects onto pages 88 and 89. Everyone is up to making the criteria list. At this point ALL "Sally" books have been handed in and graded. Many of the insects keep falling on the floor, and we are having a difficult time cleaning up. This is something the classes need to work on. Next week, many classes will be on a trip. We have to start on our Moon projects soon and the Science Fair Project (Independent Study) will begin in a few weeks. We need to get a third composition notebook for this. 6-419 started to work on a list of characteristics that determine if an animal is an insect. They came up with four items on their list. This list is the CRITERIA needed in order to be placed o the insect list. 6-237 gave in their "Sally" books for another try and 6-341 was at the concert this morning. 6-237 was taking a test today called the Princeton Review (Math) and during the time we were to work with 6-235 there was an International Food Festival. 6-419 and 6-341 worked on drawings of four insects with Mr. Olamit. The drawings are getting better and better. Tomorrow (Thursday) I will collect the books from 6-237 again. We just realized that in about a month we will be starting on our Science Fair Projects (Independent Study). You are going to need a third composition notebook for this project. You might want to begin looking for a book. 6-239 was at the Winter Concert today. The other classes went on to drawing what they believed insects look like, or drawing insects from real specimens. I took a look at the drawings. They are really great. Everyone is getting soooo much better at capturing the essence of a specimen through their sketches. Today I grade the last set of "Sally" books from 6-239. 6-235 will re-hand-in their "Sally" book on Thursday. Today classes did different things. 6-341, 6-419 and 6-239 began the unit on Insects (Bug Camp) by filling out a KWL chart on insects and drawing a picture of an insect. They then compared their pictures and did a compare/contrast. 6 -235 went on to the next step. They looked at four real insects and drew pictures. The object is to come up with a list of attributes that say this is what a bug is and how it is formed. 6-237 went over Google Earth today. I am not sure how they fell behind our other classes, but we will catch up. Every class has now had the opportunity to see how the "Google Earth" program works.6-235's books were collected and graded today. The sixth grade second floor classes were watching a movie all afternoon in the auditorium, and we had our Holiday Dance this evening. 6-237 and 6-239 still have to get their "Sally" book graded. We hooked a computer up to our new projector and learned how to download and use the program Google Earth. In "Sally" we have an aerial photograph of Veterans Plaza and we need to explain how to obtain this type of photograph from the internet. We also have to get a photo like this for page seven (7) of the My Piece of the Neighborhood Project. We need an aerial photo and map of our study site at home. I went to the restaurant supply store during period 7 and 8 to get stuff for the dance. I really love the word "stuff"; it is so scientific. Tomorrow is our Holiday Dance. Classes 6-341 and 6-419 worked on setting up the insect (Bug Camp) and Moon Project in "Sally". 6-235 began the insect project today. They started with the KWL Chart and then drew a picture of an insect. After comparing the pictures with other members of their team, they came up with criteria for being an insect. 6-237 was taking the ELA Reading Test. Tomorrow everyone will be working on our new insect unit. So far we have marked (graded) the "Sally" books of 6-341 and 6-419. 6-419 went on a trip today, so I only met with the second floor classes. We glued our Moon Project into "Sally" and we set up our notebooks to begin a unit on Insects called "Bug Camp". We will be starting this unit very soon. Today 6-341 turned in their books. Mr. Grambo went to their homeroom to collect them. Today, all our classes went outside to finish their Maps of Veteran's Park. It was realllyyyy cold outside. During our next time outside (sometime in January) we will make a site entry onto page 73 of "Sally". Tree and Leaf projects are being collected this week. 6-341 has their books being collected on Tuesday. Mr. Grambo is at Taconic with Mr. Blum. The Tree and Leaf project is due on Monday. The white card with the single leaf identification is also due on Monday (December 4) Your "Sally" notebook will be collected and graded this week. The finished group map of the triangle park (Veterans Plaza)will be due this week also. Mr. Grambo went to a curriculum writing meeting today. We worked on a word search puzzle about insects. put in the 3 map worksheets on page 82. I pointed out the new journal entry space on page 83. Then I went over the expectations for the group maps of the park (group grade, labeling possibilities, using a key/legend, due date being next Monday); they worked solely on maps for appx. 10 minutes, then we passed out the word search. Some finished the word search while others know to turn it in tomorrow. Today is part of Thanksgiving Recess. School is closed today. This was the day before Thanksgiving Holiday. It was really cold and windy outside today. Our papers kept blowing all over the place. By 2:50 PM it began to rain. 6-341 had to come in early due to the rain. Most groups finished their maps. On Monday we have to talk about the maps and then we are going to use the books to figure out what leaves we have. Our "Tree and Leaf" project is due on December 4, 2006. Mr. Grambo talked to us today about working on our maps and how to draw them using the tools we have available to us (like the protractor). We will only be going outside one more time, so we really need to get our act together and get the map going. We also need a journal entry in the booklet on page 73 of "Sally". We brought tree samples and a slice of tree with us to the park today, so that we could work on our site study and also work on pages of our Tree and Leaf project. The Tree and Leaf project is due on December 4, 2006. We were able to make bark rubbings of Pin Oak, Norway Maple, Silver Maple and London Plane bark. We could also count the tree (age) rings of a Silver Maple tree. Next Monday, we will work inside the classroom with the identification books to help us figure out what type of leaves we have. When 6-237 had science Mrs. Grate was observing the class to see what Mr. Grambo was doing. All classes have gone over to "Veterans Park", the Triangle Shape Park we went to across from the front door of the school. This park was built in 1997. There is a stone on the floor of the park that gives this information. All classes have gone over the pages in "Sally" that work on mapping the park and working on a field/site study. Our Field Journals are a first hand record of our work and our thoughts. The writings and illustrations are our evidence and proof of what we believe. Our field journals will help us remember our observations and will show others what we have done. We will go to the park all of next week. We should also start our site study for the "My Piece Of The Neighborhood" project. We have the "Tree and Leaf" project due soon (December 4). We should have collected ten leaves by now, and should have glued them to pages 42, 43 and 44 of "Sally" and we should have identified them by name. We also need to answer all questions in "Sally" from pages 33-41. Today, 6-239 went to the Triangle Park for the first time. It was messy, but it did not start to rain yet. 6-341 and 6-419 worked inside the classroom on pages in their "Sally" notebooks. On page 73b of the Journal booklet, we talked about the Purpose of Making A Journal. We then went on to question what is in a field journal. After a discussion, we worked on pages 76-77 then 70-71 and finally page 69 of "Sally". Make a detailed map of the park that includes the sidewalks, grass areas, walkways, trees and bushes. Go to page 73 of "Sally". Work on a site visit to a small area of the park that your group has selected as their, in -class- park study site. This site will be visited again this year. We have set up this project so that students will understand how to do their "My Piece Of The Neighborhood Project" On Thurs/Fri we have to talk about how to keep the equipment clean and ready for the next group/class to use. We were supposed to begin our work outside today, but most students showed up to class without their jackets. We will try this again tomorrow. In class we worked on Map Sheet that are on pages 80 and 81 of "Sally". How are maps different from each other? How are they similar to each other? What (or legend) is a key on a map for? If we are going to make or draw a map, we should understand what a map is and why they are made. Today is also Open School Afternoon. Mr. Grambo will see parents all afternoon. Today, all our classes worked on reading A Scale Ruler. We started off with the idea that it is impossible for us to make a life size map of the park. Where would we get a piece of paper that large? How would we fold it or carry it? We would need to make it smaller; we would need to "SCALE" it down. Let us say that we used the idea that every one fourth of an inch on our map or drawing is equal in real life to one inch, then a line drawn that is 2/4 or 1/2 of an inch stands for two feet. A four inch line stands for 16 feet. This is how we work the idea of scale. We had to answer questions 4 and 5 on map sheet 3 today. We also got our new text book.It is from Glencoe (McGraw Hill) Publishing. The title of the book is New York Science Grade 6. Today we worked on learning to read and use a ruler. Since our Site Study requires us to know the size and shape of object we find on our study site, it is important for us to know how to use a ruler. On Map sheet 1, we had to read actual ruler markings. On Map sheet 2, we had to measure object that we might find on our site. These two papers along with a third which we will do on Monday (Using a Scale Ruler) will all creatively be put onto page 82 of "Sally". Remember that next week is Open School Week. Mr. Grambo was not in school today. He left work about using the ruler (Map/Ruler sheet 1). Since we are making maps, it is important for us to know how to measure the size of objects using a ruler. We also had to write a procedure (set of instructions) that explain how to use a ruler. After this paper has been handed in and graded it will be glued with two other sheets of paper onto page 82 of "Sally". 6-237 and 6-239 do not have science on Thursday. This work was send to their classrooms for them to do as Homework..
Today 6-237 and 6-239 went on a trip to the Jewish museum. 6-419 never made buttons on Monday (they had a trip) so they made their buttons today. 6-341 learned about the equipment they would need to do the site study ands mapping activity in the park. We went through their backpack, drawing board and tool box filled with supplies like microscopes, shovels and collection boxes. We also found out that Zulay in 6-419 will be our new sixth grade Vice President for the Student Organization. There is no school today. It is Election Day. Most of the teachers were in school at meetings. Others went to meetings outside our school building. Most of the classes made buttons with their name on them today. Mr. Grambo is having a difficult time remembering everyone's name. Hopefully these buttons will help. Everyone had fun using the button machine. We also glued a permission slip onto our "Sally" book so that we can get out coats when we need to go to the park to work on our Site Study. 6.419 went on a trip today. There is no school on Election Day, which is tomorrow. Today we finished all the work we needed to begin the two projects we will be doing in "Sally" We added the pages for 76-81 and are ready to go to the triangle park across from school to work on our class SITE Study. We got a sticker for our planner today to remind us that the Tree and Leaf project is due on December 4, 2006. Miss Angie with 6-419 came up with this idea. Mr. Olamit thinks we need a permission slip to get our coats to go outside. This is a great idea. We will glue this slip into our "Sally" books on Monday. We put leaf identification books on the round table in class. This will help us identify the leaves we glue into our books for the Tree and Leaf project. Today we finished gluing the sheets for the Field Study project into our book. We left a space on pages 74 and 75 for the addition of summaries. There is a sheet for Aerial Photographs and for mapping. I was in the Auditorium for a good part of the day working with assemblies for Student Government Officers. Today we started our class project on Journaling. We worked on page 68 in "Sally" today. Our questions were about what we thought we would discover by visiting a study site on a regular basis. We also talked about what we really wanted to learn about our sites. One thing I wanted to learn about the small triangle park across from school was Who Owned It? It was rather neglected for years until the NYC Parks Department took it over. We are leaving pages 74 and 75 of "Sally" for Journal Entries. Tomorrow we have our S.O. Assemblies for elections. Today we talked about the three (3) projects we were going to start in "Sally". One is the Tree and Leaf project (starting on page 33) another is My Piece Of The Neighborhood (beginning on page 5) and the third project has our groups working in the park across from the school. In the month long November Tree and Leaf project, we have to collect and identify ten (10) leaves from different varieties of tree and glue them into our "Sally" notebooks on pages 42, 43 and 44. We also have questions to answer about the trees age, shape and tree bark. Part of this project is to make a tree collection card. We each have to make a single card to add to the class collection. For the My Piece Of The Neighborhood Project, we have to pick a spot near our home that we can visit every week and write a journal entry about. This is a year long project. By the end of the year we should have about 30 entries for this project. Our work has us making a map of our study site, getting an aerial photo of the site, writing four (4) poems and collecting samples of plants that grow at our study site. Since we might not know how to do some of these things, Mr. Grambo will be bringing us to the triangle park across from school to make maps and learn how to make journal entries. We attached some Journal Writing sheets into "Sally" and Mr. Grambo told us that the trip to Taconic was filled up. Today, 6-235 came with me to Dead Horse Bay, a part of Gateway National Recreation Area. We went there to learn about environments on and near the seashore. We met Ranger Carol and began to explore, write about and draw the different environments we walked through. Soils change, plants change; these environments are so different. On Wednesday, Mr. Blum will take 6-319 on the same type of trip. All our classes worked on a reading assignment today about trans-fat and what is going on in New York City about it. Scientists say that trans-fat helps to clog up arteries and can lead to heard disease. New York City wants to ban this type of cooking oil from all restaurants. In class today we worked on what objects would look like from different views. A rectangular prism would have six faces. There is a top, bottom and four sides. In our drawings we work with three views of an object. We have a top view (or birds eye view), side view and front view of the object. We label things in our drawings to take away some ones ability to say "That's Pretty, what is it?" Not having to deal with some ones negativity gives us more time to spend on practicing our drawing and becoming better at it. Today during Homeroom (and period 1) everyone took a practice Citywide Language Arts Test. The test had a science passage on it. 6-237 did not go to science today because they were taking the test. Other classes were shown a page from Leonardo's notebooks on Archimedes Screw. After 3 minutes of viewing the picture, they had to make a list of things in the picture from memory. The writing about this project is on pages D and E of the Sketchbook that is glued to page 67 of "Sally". The summary for today's work is on page 72 of "Sally". Some classes did not finish the sketches of the grass, so we worked on the sketches. We also finished pages B and C of the sketchbook (which is glued onto page 67 of "Sally"). We answered questions about the differences between sketches and drawings as well as questions about real plant verses fake or artificial plants. The daily summaries for the next few days will be written on page 72 of "Sally". While 6-419 went to the Bronx Zoo and 6-237 worked on Group Games, the rest of the classes began the Ecology unit. Today we talked about the difference between drawing and sketching. We began to do some art/science activities which are going onto page 67 of "Sally". We talked about and drew grass. Tomorrow we are going to view a picture and then try to remember all of its detail when the picture is removed. Everyone was given a Progress Report today to bring home and get signed. The progress report will remind us of the work that has not been handed in. Signed progress reports will be glued onto page 193 of "Bob". Today in science we received our Progress Reports. Many of us still have to bring in our Ecology PERMISSION SLIPS. Today our notebooks were collected. The first marking period end next Friday, October 27, 2006. Mr. Grambo took all of the loose papers left from putting together "Sally" and "Bob" and put them into folders. The folders will be on the back counter in the classroom(246). Our science teachers started to collect our "Bob" notebooks. We spent the period fixing up our notebooks and making sure they were perfect. 6-419 went outside into the garden. They helped to pull out and bag up weeds. Mr. Grambo and Mr. Olamit were not in school today; they had a science meeting at the Region Office. At the Region Office (The Rock) we had a workshop on Simple Machines held by Delta Education. They showed the teachers how to use a science kit from a company called F.O.S.S. They left work to help us fix up our two notebooks and left an assignment about a reallllyyyy bad journal entry. We had to explain why it was not a good entry and how to make it better. Class 6-321 was working on the Group Games activity. There were three challenges in this activity. The first was the Hula Hoop Pass. In the second activity, your team had to pass a can from person to person without tipping over the can and spilling the ball that is inside. Oh, by the way, you could no use your arms. In the third challenge, you had to flip a mat over while the entire team was standing on it. This was the toughest challenge of all, but with a plan and teamwork, it can be done. The worksheet for this activity is being collected and graded. The rest of our classes were putting together their "Sally" notebook. There are several pages that have written material on the pages as well as glued on sheets. We are ready to start on our Ecology Unit. Class 6-237 has to hand in their "Sally" book on Wednesday (10/18). Today Mr. Jaycox and I put together this web page. It has some problems with older versions of Mac. computers. Today we had a QUIZ on the Triple Beam Balance. A balance is like a see saw at the park. When one force gets on the see saw, that side of the playground amusement goes downward, while the emptier side goes up. To balance the see saw, another force needs to get onto the side that is up in the air. A balance works on the comparison of forces. A Spring Scale measures how far a spring is stretched or compressed (squished). Since stretching and squishing are Pulls and Pushes, a spring scale also measures Forces. We worked on the Third Iteration for our Book Support Project. The even numbered tabled had to build a support that could hold up the most weight. The odd numbered tabled had to build the support for the cheapest price. We had to use the balance to measure the force of the books put onto the book support.